Marc Chagall is an enigma. On one hand he is one of the most successful 20th-century artists, in the major auction rooms, with paintings achieving up to £28m, yet he remains overshadowed by his contemporaries Picasso, Matisse, Modigliani and Soutine. That is until now. The recently opened Summer exhibition at the Guggenheim Museum Bilbao organised by Kunstmuseum Basel is a magnificently curated show by Lucia Agirre. It covers the breakthrough years 1911 – 1919 where you can trace the evolution of his Russian Modernist roots to his involvement in the School of Paris. It is evident that Robert and Sonya Delaunay were a strong influence on the work of Chagall, although his practice always absorbs and evolves beyond to create something uniquely original. Chagall’s experiences during the early years led to the development of his rich visual style. Themes of the works in the exhibition cover universal subjects such as love, suffering and death – also self-portraits, Portraits of his first wife Bella, depictions of the circus, music and peasants are recurring and central to his practice. Chagall was born in 1887 (Moishe Zakharovich Shagal) to a Hasidic Jewish family in White Russia (now modern-day Belarus) He lived in Paris from 1910 to 1914 then again after his exile from the Soviet Union in 1923. Life in the shtetls was characterised by poverty and a poor level of education, most of which was provided by locally organised Jewish schools. Chagall’s mother, a strong minded woman, bribed the headmaster at the local Christian school with 50 roubles to accept her son into mainstream education. Chagall was thus educated exposing him to art as well as the usual level of subjects. There was no art of any kind in Chagall’s family home, and the concept was alien to him. He observed a classmate drawing which prompted him to try the discipline. He began by copying images from books and soon had decided he wanted to be an artist. In 1906 he studied at the studio of Yehuda (Yuri) Pen, a realist artist who also operated a small drawing school in Vitebsk, which included the future artists El Lissitzky and Ossip Zadkine. Due to Chagall’s youth and lack of income, Pen offered to teach him free of charge. However, after a few months at the school, Chagall realised that academic portrait painting was not for him. Chagall moved to Saint Petersburg a few months later. As Jews were not permitted into the city without an internal passport, he managed to get a temporary passport from a friend. He enrolled in a leading art school and studied for two years. In 1910, at age 23 he moved to Paris where he met the Poet/writer/art critic Guillaume Apollinaire and other avant-garde luminaries. Chagall remained there until 1914 but with the outbreak of WWI returned to Russia to marry Bella. The couple returned to Paris after the war and Chagall’s reputation grew internationally. Durring the outbreak of WW2 Chagall was arrested in Marseilles by the Vichy government during France’s occupation by Nazi Germany but escaped to the US with help from Alfred H. Barr, Jr. director of the Museum of Modern Art, and collectors Louise and Walter Arensberg. Chagall lived through a revolution, two world wars and a period of exile before dying in France at the age of 97. Many of his works were lost during turbulent times in Europe, so several paintings were recreated by the artist over his long career. Some of the original paintings have reappeared so there are two distinctly different versions of the same painting. 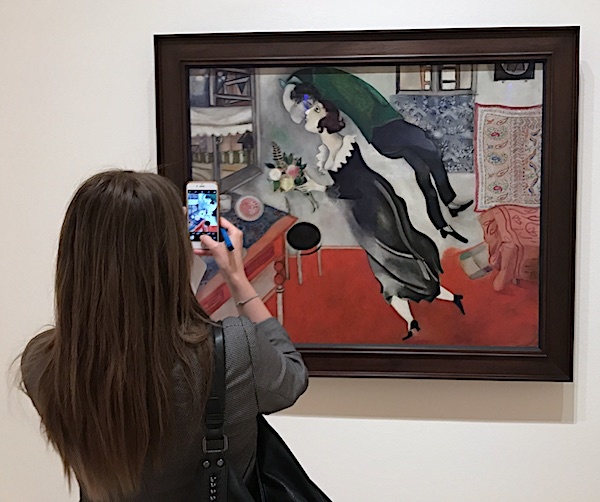 In 2013/2014 a series of exhibitions opened in Europe which in many ways has reassessed and raised Chagall’s importance and relevance in the 21st century. One was Chagall: Modern Master which opened not in London but at Tate Liverpool. 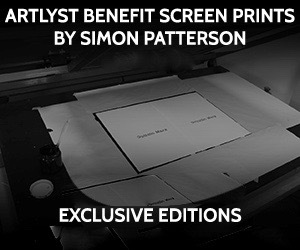 This was a decision by Tate not to feature the artist in the capital. 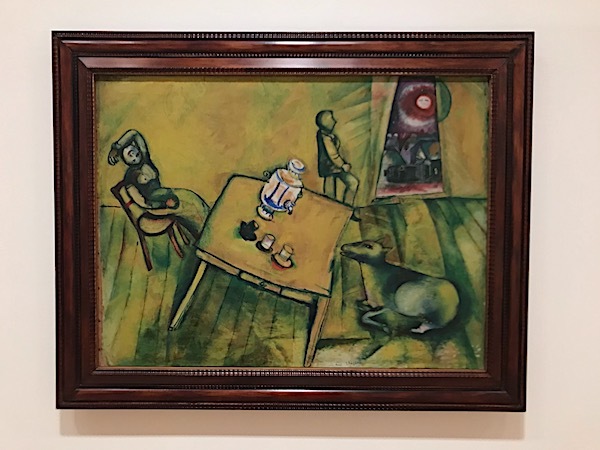 The exhibition focused on Chagall’s time in Paris before the First World War, his visit to Berlin and his exhibition there in 1914, and the years he spent in his native Russia around the time of the Revolution in 1917. Chagall fits into many of the great movements of the 20th-century, however his work never fully aligns with one particular genre of painting. His style remains distinct. He is colourist of great magnitude breaking many of the barriers that other painters of his generation could never achieve.